If you’re looking for the highest quality Orlando Walk-In Cooler repair and maintenance, call the experts at All Temp AC and Refrigeration—we have the experience necessary for keeping coolers running regardless of the weather or time of year. We understand the demands placed on walk-in coolers, especially those running in Orlando, and we know what to do to keep yours running so you won’t have to deal with downtime. Our technicians are familiar with all brands of walk-in coolers, whether they are in a grocery store, restaurant, hotel or other establishment—if your cooler is acting up, we can fix it any time of the day or night, and any day of the year as part of our emergency service. We can also help if you need assistance with installing new equipment, removing old stuff or learning how to use and maintain your cooling systems. One of the biggest factors in preventing cooler problems is periodic maintenance. We know that not all coolers are alike and that they aren’t used in the same ways. That’s why we offer customized maintenance agreements. We can tailor your service to meet the unique needs of your equipment, taking into account of the environment in which it exists. We do more than just replace parts too. We test components, calibrate them, and clean inside casings to ensure motors won’t overheat. With our maintenance agreement, you’ll find your equipment experiences fewer problems and runs more efficiently, saving you money on your energy bill. For those looking for non-traditional cooling options, we also offer Industrial & Process Type Refrigeration, and Walk In Wine Coolers. We can design and build a custom walk-in cooler for virtually any application you can envision. Our technicians have extensive experience working with research laboratories, small shops, industrial operations and other businesses looking for a way to add unique walk-in cooler equipment. Once built and installed, we also offer a maintenance agreement that fits your needs. We want you to be happy with us and your equipment at All Temp AC and Refrigeration, so that’s why we offer a 100% satisfaction guarantee on whatever we do for you. 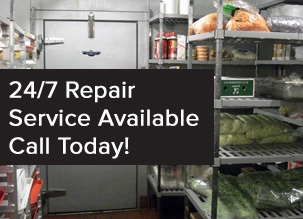 Contact All Temp at 407-857-7800 (Orlando Area) or 813-630-9400 (Tampa Walk in Cooler Services) for the highest quality Orlando Walk-in Cooler repair and maintenance.